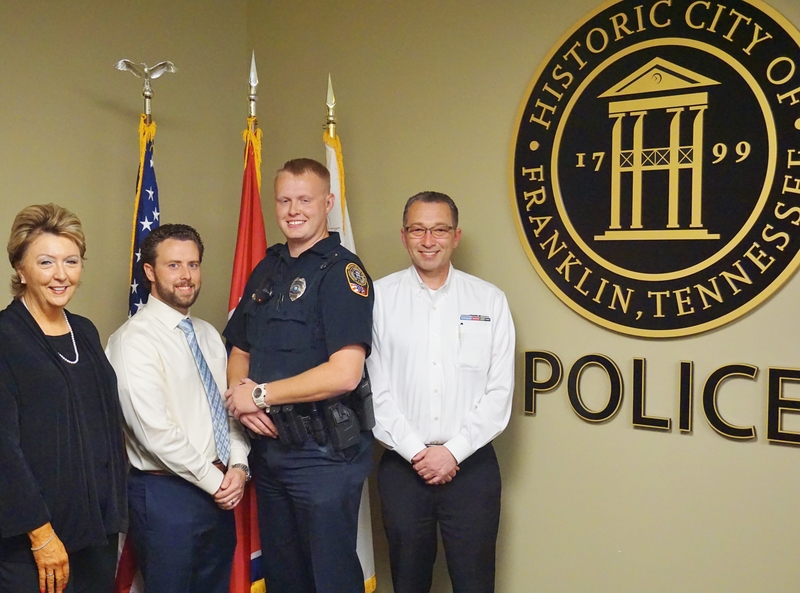 Franklin Police Officer Britton Cornell has been named Officer of the Month. The honor follows his work to identify two serial suspects responsible for committing multiple felony thefts in the midstate. Over the summer, several middle Tennessee cities experienced a rash of thefts of wheels and tires from parked cars. In these cases, vehicle owners would return to their car and find it up on blocks, with the wheels and tires completely removed. Franklin had two reported incidents: one at a hotel and one at an auto dealership. On the lookout for suspects, while working the midnight shift on August 2, Officer Cornell was surveilling a Franklin dealership when he encountered a suspicious vehicle on an adjacent dead end street. The driver and passenger provided Cornell with bogus information about what they were doing in the area, and Officer Cornell saw cinder blocks, like the ones cars were left on after previous thefts, in the rear of the vehicle. Officer Cornell detained the suspects, who were ultimately identified as perpetrating previous, similar thefts in Nashville, Mt. Juliet, and Franklin. “I am extremely proud of Officer Cornell’s work,” said Chief Deborah Faulkner. “His professionalism and dedication to keeping Franklin safe led to the identification of two suspects who had stolen more than $50,000 worth of property.” In addition to being named Officer of the Month, Cornell was awarded a Departmental Certificate of Accommodation for demonstrating outstanding police work. Toyota – Cool Springs and Franklin Chrysler, Dodge, Jeep, Ram are proud sponsors of the Department’s Officer of the Month Program. Each month they honor a Franklin Police Officer with a commemorative plaque and a $150 check for the officer to donate to the charity of their choice. Officer Cornell is donating the money to his favorite charity: The Wounded Warrior Project, a charity and veterans service organization that offers a variety of programs, services, and events for wounded veterans of military actions following September 11, 2001.